Journalism students used to use the "Five W's and an H" (Who, What, Where, When, Why and How) as a template for composing a hard news story. The difference between then and now is that then, reporters would try their best to answer those questions for their readers. Now, they just walk around muttering the words like Vinnie Barbarino ("What. Where. "), as if the answers weren't really worth knowing or caring about. For the past five years, the press have fawned over Joe Wilson and Valerie Plame, dedicating a countless number of virtually fact-free articles to their supposed heroism and victimhood. Now that a story comes along that contradicts the media-created legend of the whistle-blowing ambassador and his secret agent wife, their names aren't even connected to it. Recently, our military brokered a deal between the Iraqi government and a Canadian energy company, for over 500 tons of Saddam Hussein's uranium. The U.S. had successfully whisked the material out of the country shortly after the 2003 invasion, and secretly held it at Diego Garcia, a British territory in the Indian Ocean, until a buyer could be found. This uranium had already been known and written about in 2003, but it was not treated as relevant because it predated the '91 Gulf War, and Saddam was believed to have abandoned his nuclear ambitions at that time. Information has since come to light, however, that changes the story altogether. 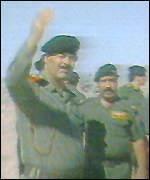 Two years ago, transcripts were released of several of Saddam Hussein's audiotaped meetings with his advisors. In one of those recordings, he and two of his scientists discussed the viability of a method of uranium enrichment called plasma separation. That tape is estimated to have been recorded no earlier than 2000. At the time that the Saddam tapes were released, the media had no recollection of his 500 tons of uranium. Now that we've been reminded of the uranium, they have no memory that he was actively pursuing its weaponization. They refuse to construct an accurate chronology of these events, because it would destroy their anti-war narrative. Their story begins with the 2003 State of the Union Address, where President Bush is supposed to have said that Saddam had purchased uranium from Niger. What he'd actually said was, "The British government has learned that Saddam Hussein recently sought significant quantities of uranium in Africa," but his critics had to misrepresent that statement in order for the next chapter to fit into the story. Enter Joe Wilson, back from his phony fact-finding trip to Niger, where he falsely claimed to have been sent by Vice President Cheney. Wilson reported -- not to Cheney but to the New York Times -- that he'd found no evidence of any sale of uranium to Iraq, thereby purportedly demonstrating that Bush had sent us to war under false pretenses. In explaining that his boss hadn't ordered the mission, Cheney's chief of staff Scooter Libby identified Wilson's wife, CIA analyst Valerie Plame, as the probable source of his assignment. This led to charges that the administration had endangered lives by exposing a secret agent. This despite the facts that Libby was not the first to divulge Plame's identity, and that Plame was not a covert operative, but instead worked at CIA headquarters in Langley, making her employment with the agency about as secretive as Hush Puppies. The point to this tale is not to dispute that Saddam possessed uranium, because he was in possession of 500 tons already. Rather, the controversy was in the president's suggestion that the Butcher of Baghdad still sought the means to use it. Wilson continues to say that Bush had lied about that, although the facts now assure us that he hadn't. Anybody who cares to piece together the true story will see that: (a) the British government stands by the statement that Bush attributed to it in his address; (b) Wilson's Niger trip was a dishonest and mutinous attempt to undermine a war effort already underway; and (c) Saddam Hussein fully intended to weaponize his uranium, almost a decade after he had supposedly given up his nuclear program. This is not the story the media want to tell, so they simply don't. Instead, they develop hysterical WM-nesia. Mention the Saddam tapes, Joe Wilson and 500 tons of uranium in the same context, and they'll respond as if in a Barbarino-like state of blissful ignorance. "What. Where. When. Who." As a result, news consumers are left quoting another of Vinnie's famous lines, "I'm so confused!"